There is no doubt that mechanical keyboards are great for typing and gaming. However, most of the mechanical keyboards suffer from a very common problem known as key chatter or chattering. During key chatter multiple inputs are registered in a single key-press which is very irritating and annoying for both gaming and typing. This means if you press ‘d’ key then it may get registered as ‘dd’ or ‘ddd’ if it is severe. Key chattering can arise in a single or multiple keys in a mechanical keyboard and it generally arises when the keyboard gets older, but it can also occur in brand new keyboards too. The problem is more pronounced in mechanical keyboards with Cherry MX Clones or Chinese mechanical switches i.e. Outemu, Kailh etc., but I have seen key chatter in branded mechanical keyboards too (i.e. Corsair, Ducky etc.) that are having original Cherry MX mechanical switches. I personally have faced this key chatter problem with my Cherry MX Blue keyboard after only few months of usage. 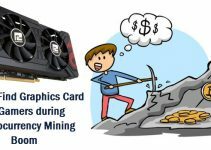 If your keyboard is in warranty then you can issue a RMA request and get a replacement but it is a bit of time consuming and it is also not guaranteed that the new keyboard will not face this chattering issue. 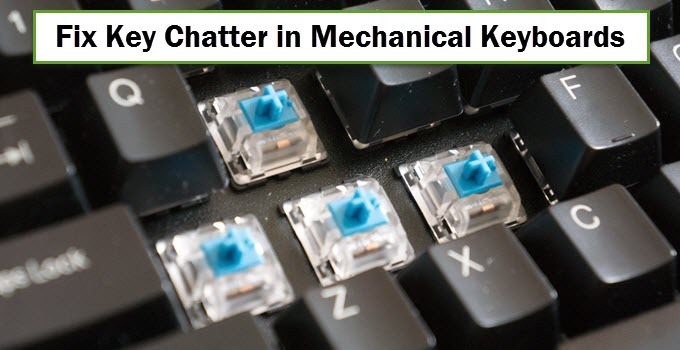 Key chatter can arise due to different reasons and here I am going to list down all the causes of this problem, and will tell you on how to fix key chatter in mechanical keyboards permanently. Here are the various reasons that can cause key chatter in mechanical keyboards. Dust – Dust in a major factor contributing to this key chattering problem in mechanical keyboards. Dust can go in the mechanical switches and can cause malfunction of switches. So, it is advisable to keep your keyboard away from dusty environments and keep it covered when not in use. Faulty Switches – Faulty and Defective mechanical switches is another major cause of key chattering in mechanical keyboards. The switches may become faulty after some time or it can also be a manufacturing defect straight from the company or manufacturer. I must say that the quality of mechanical switches is getting doubtful these days as I have seen many cases of bad switches lately. Rough Usage – Well if you type hard or play hard then you can be damaging your mechanical switches with extra force, and this may cause them to function improperly leading to the most common problem which is key chatter. Temperature – Well this is not a major factor but if you keep your keyboard in hot and humid conditions then mechanical switches may not perform normally and this can lead to key chattering. Here are some of the common ways by which you can try to fix the key chatter in mechanical keyboards, but I personally do not recommend them especially if your keyboard is new and under warranty. Compressed Air – You can try use compressed air to clean the mechanical switch and to make it work again normally. Remove the key-cap, press the switch and blow air using a compressed air can or duster in the switch and repeat this process two or three times. Well it is not guaranteed that the switch will come back to normal functionality eliminating chatter but it can work sometimes if the chattering is due to dust related issue. Tapping it constantly – Tap the defected key hard multiple times and see if the problem goes away. Some users have reported to solve key chatter issue like this but I do not recommended this method as you can cause more harm to the switch and making the problem worse. Not Recommended but for knowledge purpose. Replace Faulty Switch – Replace the faulty switch with a new one and your problem should go away. This method is not for everyone as it requires opening up your keyboard, de-soldering and soldering the switch, which only experienced users who have good technical know how can do it. You can buy Cherry MX mechanical switches online but other Cherry MX clone switches can be hard to find. This is also a very risky procedure and should not attempted by a noob or novice user, otherwise you may end up damaging your whole keyboard. Replacement (RMA) – You can issue a RMA request and get a replacement if your keyboard is under warranty period. Well this sounds good but you will never know that the replacement keyboard is completely free from key chattering because this problem may arise in the new replaced keyboard too after some time. It is a very time consuming process too and can hamper your productivity. So, it is up to you that whether you want to take this chance or not, because it may happen that the replacement piece may come with bigger problems compared to the older one. Here is the most preferred and safest way to fix chatter in mechanical keyboards, without the need of any physical interaction. This method works with any number of keys that have chattering or double typing issues. This method fixes key chattering problem on the software side and it is very flexible and easy to implement. Also, this solution works with every mechanical keyboard with any switch type. Follow the steps mentioned below to fix chattering issue with your mechanical keyboard. Step 1. Download the Keyboard Chattering Software from here. Step 2. Unzip it and start the Keyboard Chattering Software executable file from the folder. Step 3. 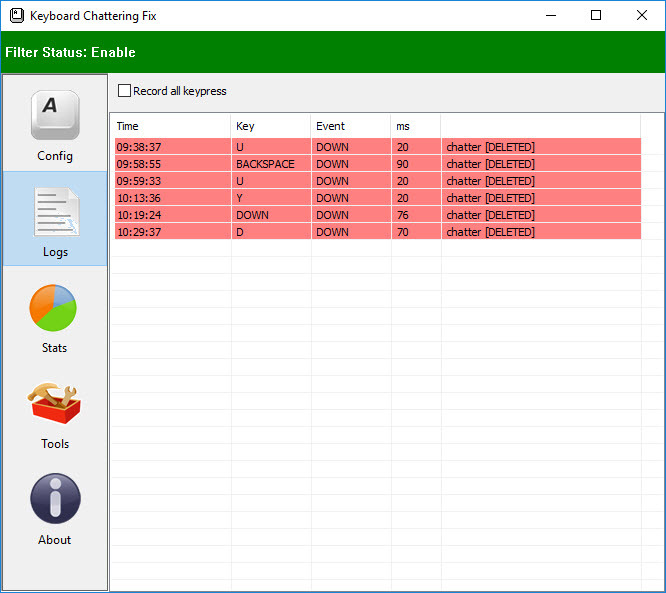 Here in Config menu, Enable Chattering Filter and in Threshold change the value from 50 to 90 to completely fix key chatter issue. Click on Apply and minimize the software. Now this software will delete any kind of duplicate inputs or repeated characters that arises due to key chattering. It can automatically filter key chattering without interfering with your work. I find 90ms to be the sweet spot for removing duplicate inputs even if the key chatter is on the worst side. Now you don’t have to enable the Keyboard Chattering Software every time you start your PC. 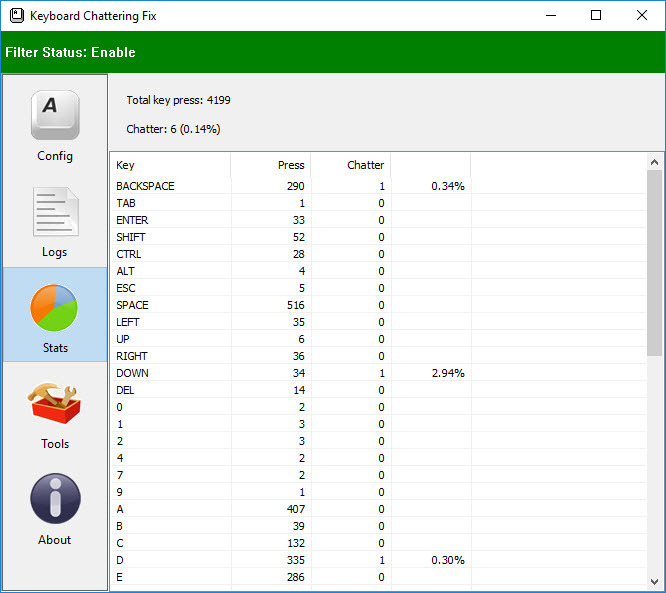 Keyboard Chattering Software also keeps the Logs of the keys in which chatter is detected. Also, you can check out the Stats about the keys that chatter most number of times. You check it out in the pic below. Another addition is the Tool section where you can temporarily disable the keyboard and mouse for cleaning purpose. 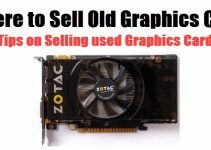 This really comes in very handy as you do not have to unplug your keyboard and mouse when your computer is running. 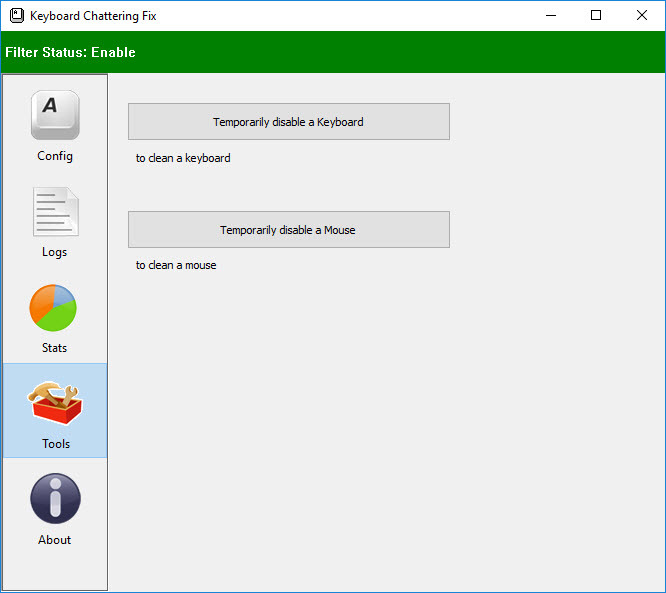 Note: Keyboard Chattering Software is a freeware and a safe software. It does not contain any kind of malware, viruses, adware or keylogger. Also, it supports Windows 10 operating system too. I have been using this software personally and it working great so far without any issues. It is also ultra-lightweight and consumes almost negligible resources. If you still have got any queries on key chatter with your mechanical keyboard then you can ask me your queries by leaving a comment below. I would be happy to help you out and fix your problems. Anyone have a link to this software? This link doesnt work. Thanks man! You are a life saver! 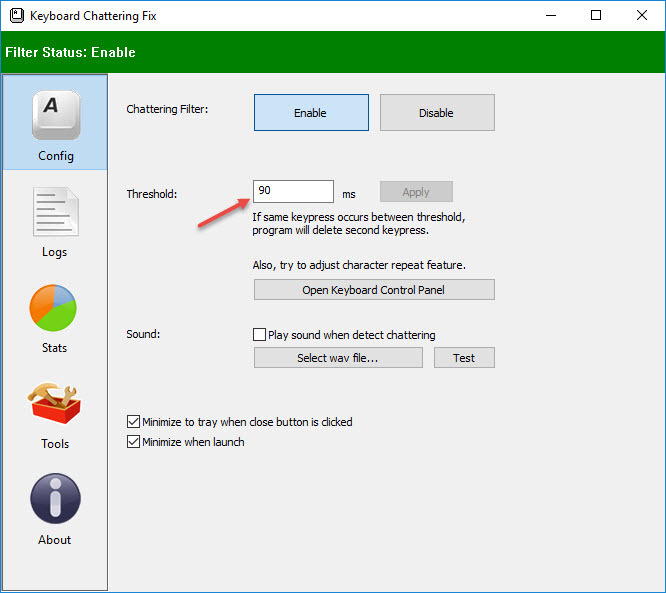 I’ve been using keyboard chatter fix app for more than a year. I noticed recently that it uses enough resources to make my game lag (PUBG). Especially when you press more than one key at the same time. more keys means more CPU usage. I only have i5-4460, so it affects my game performance. Can you provide me some numbers about CPU usage because for me it seems fine, but i have not tested it with PUBG. The app use from 2% to 9% CPU, depending on how many keys were pressed at the same time and how frequent. I can get up to 11% if I press more than 8 keys repeatedly. Thanks for the input. I think i have to disable it too when gaming. Cotton buds, Isopropyl Alcohol and compressed air temporarily fixes many of my brown switches on this K70 (was replaced twice during warranty over this issue), but of course, you eventually end up chasing new faulty keys every few days. Suffice to say, mechanical keyboards are more trouble than they’re worth. I like the software method idea, but not all of us are limited to Windows. 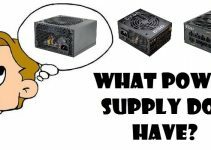 I use Win 10 for gaming, but Linux for development, so I would need something for all operating systems. Source code anyone? The quality of mechanical keyboards (especially switches) has surely degraded over the years. No matter how expensive the mechanical keyboard is, it will give you key chatter somewhere in near future. I have experienced this with three of my keyboards and it is very heartbreaking. Sadly, I don’t have the source code for the key chatter software but if I find one then I will update the post with it. Does the software solution introduce any kind of input delay or does it affect performance in any way? Personally I haven’t experienced any even in high-end games, but may be on older systems it can have some very marginal impact. P.S. 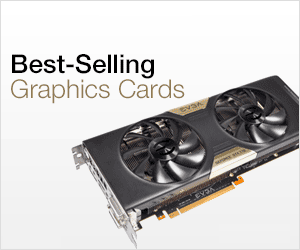 – I am using Core i5 7600. This software is incredible !!! THANK YOU SOOOOOOO MUCH ! !